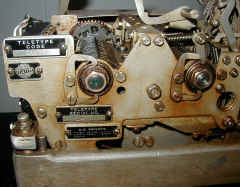 A number of stations have been able to obtain some of the model 28 Reperforator-Transmitter (RT) sets at 100WPM that Navy MARS received from the State Dept. This month we will cover that unit and in particular the TD unit that seems to be giving everyone a hard time. The TD is called the LAXD. 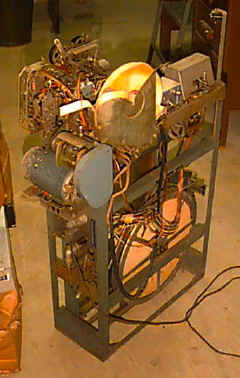 The LAXD is a climbing or pivoted head TD and is usually used together with a typing or non-typing reperforator. It is able to sense or read the last character that the reperforator has punched. There are two clutch magnets (see diagram) in the LAXD TD. One is called the reader and the other the distributor. They are both 200 ohms and need 160 MA to close them. 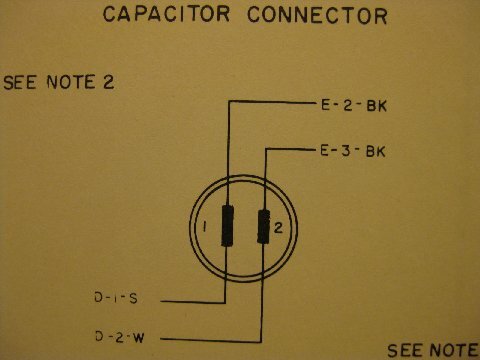 Teletype Corp. says 48V direct current is required for each one. Now before you go run and connect them in series, read on. The thing that confused most, including myself, is that the clutch magnets can not just be connected together. 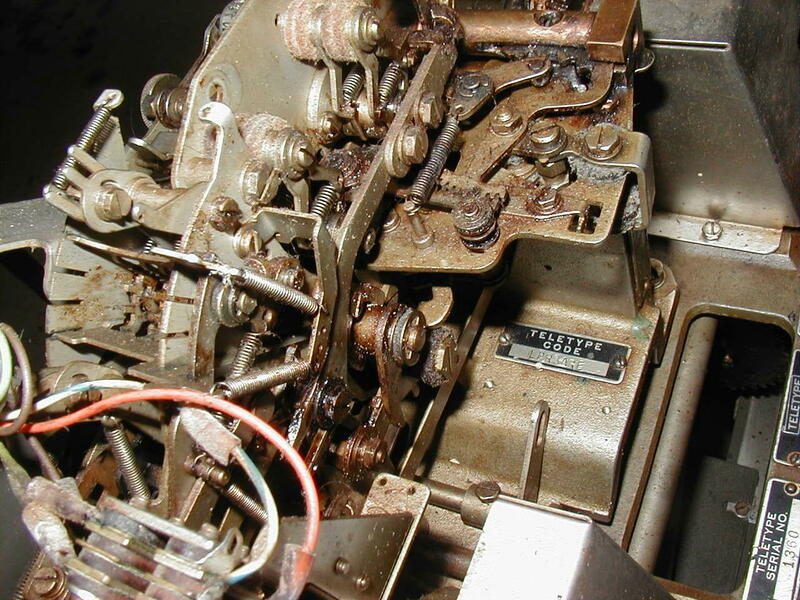 (for example, in series) The important fact that was discovered before I had any diagrams is that: the reader clutch magnet and the reader cam shaft together with the distributor clutch contacts control the distributor clutch magnet. This means that BC15 and BC22 (see diagram) must be connected in series with the distributor clutch magnet circuit. This is very important, otherwise the unit will not function properly. 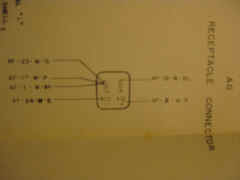 As you can see 1000 ohm 5 watt resistors were added to each circuit (see figure 2) to in able the circuit to work on 115 VDC. 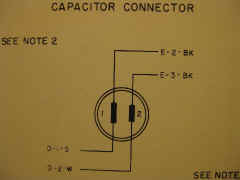 If you have 48 VDC, the resistors can be removed. I have not tried the unit with AC. If anyone does and it does work let me know. 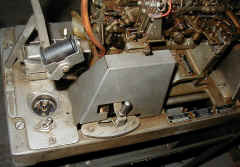 The transmitter stop contact (BC25 and BC26) it the control which stops the pivot head when it hits the reperforator punch block. The trans aux. (BC13 and BC24) and dist. aux. (BC 9 and BC8) are not used. They are intended for two cycle operation. Can't think of another use for them. If anyone finds a use for them let me know. I think figure 2 should pretty well cover the TD control circuits. The only other circuit is the signal line. The code reading contacts must be connected in series with the distributor contacts as shown in figure 3. All of the connections for the TD are brought to a 32 pin connector (female) on the back of the base of the RT 28 unit. I suggest that a power supply giving 115 VDC at 300 MA be constructed and all of the connections for the unit be made in the power supply. A male plug can plug into the unit and the other bought to the power supply and terminal strip. 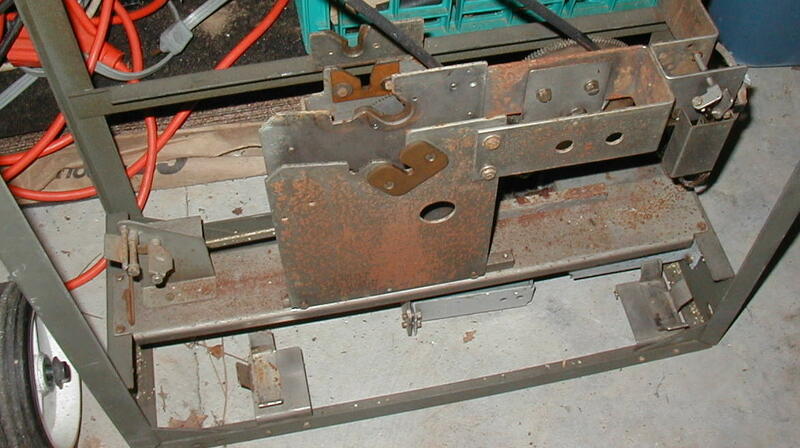 The signal line might be brought to a female phone jack for patching into the other TTY circuits in the shack. 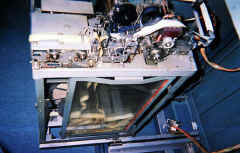 We are using two of these RT 28 units here at NAV-2 with very good results. 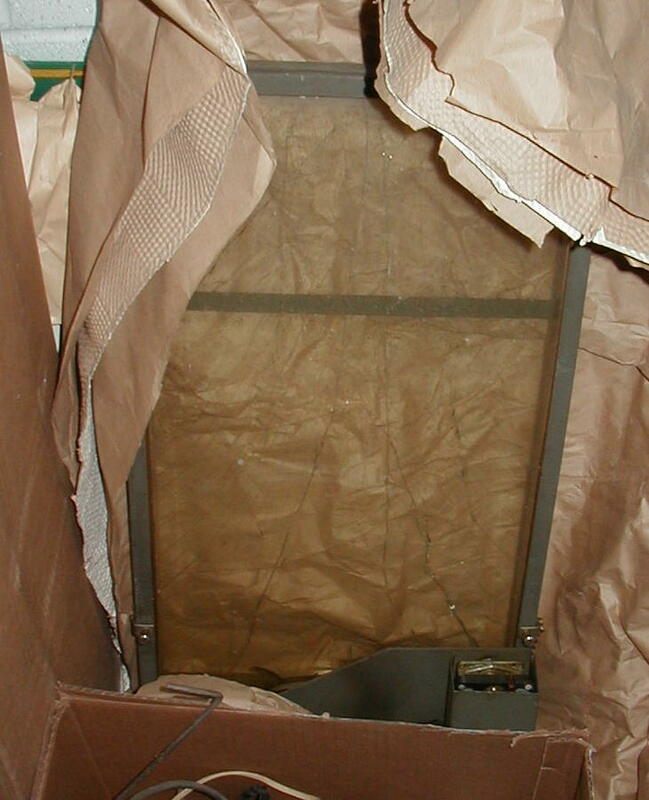 The storage bin is great for storing up to thirty messages of average length for later transmission. 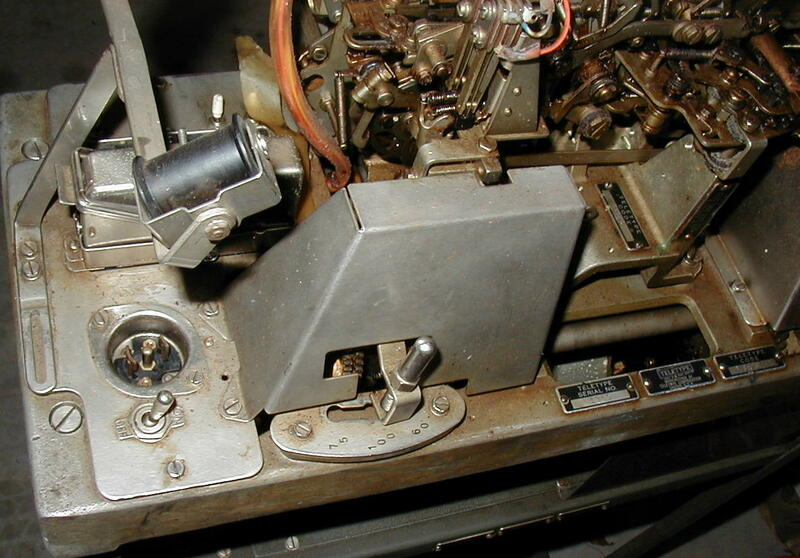 We do not use the tape winder because it curls the tape and makes it very hard to retransmit. We let it fall into a plastic waste basket. We were lucky to obtain a cabinet that houses two of the units with power supplies. 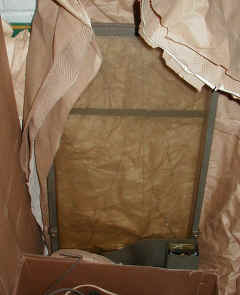 A great deal of modification was necessary to the cabinet. I am going to make this info available to N0RTP/W4PFC as soon as I get them into a finished form. They are the only other ones I know of that have a cabinet. With the new multi-speed provision for amateur RTTY, the Model28 reperforator-Transmitter or “RT” Set should become quite popular. 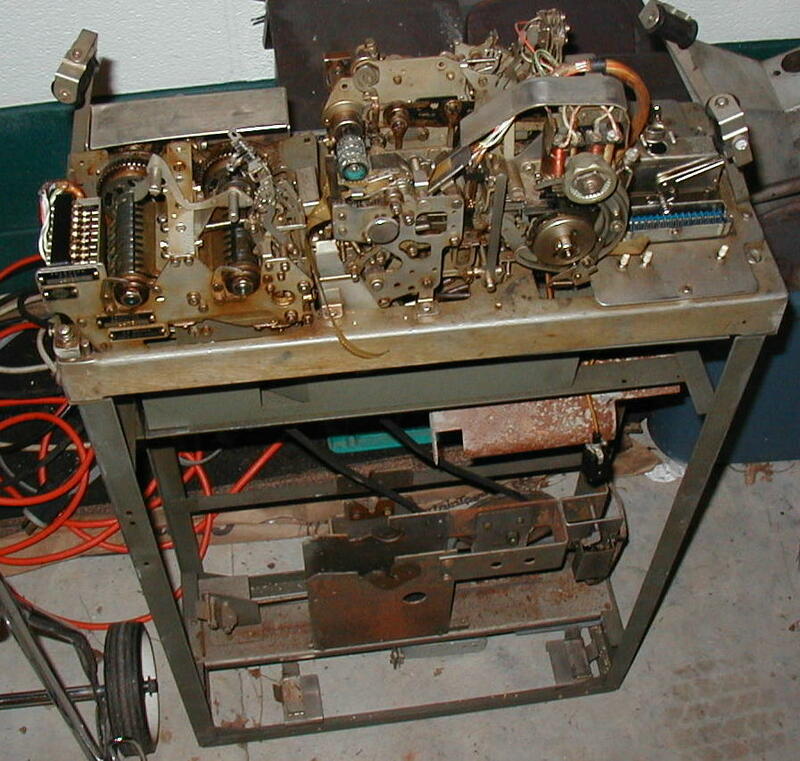 This is the model 28 version of the older FRXD. Most 28 RT sets come equipped with three speed gearshifts on both the reperf and the T-D – allowing down speed conversion as well as up speed conversion. 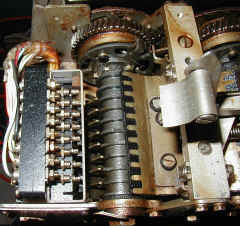 Down conversion cannot be done with the “simpler” electronic speed converters, as there is no provision made for storage. Converting from 100 WPM down to 60 WPM, for example, requires storage provisions for four characters every second. To operate under these conditions for any length of time requires a tremendous amount of storage. 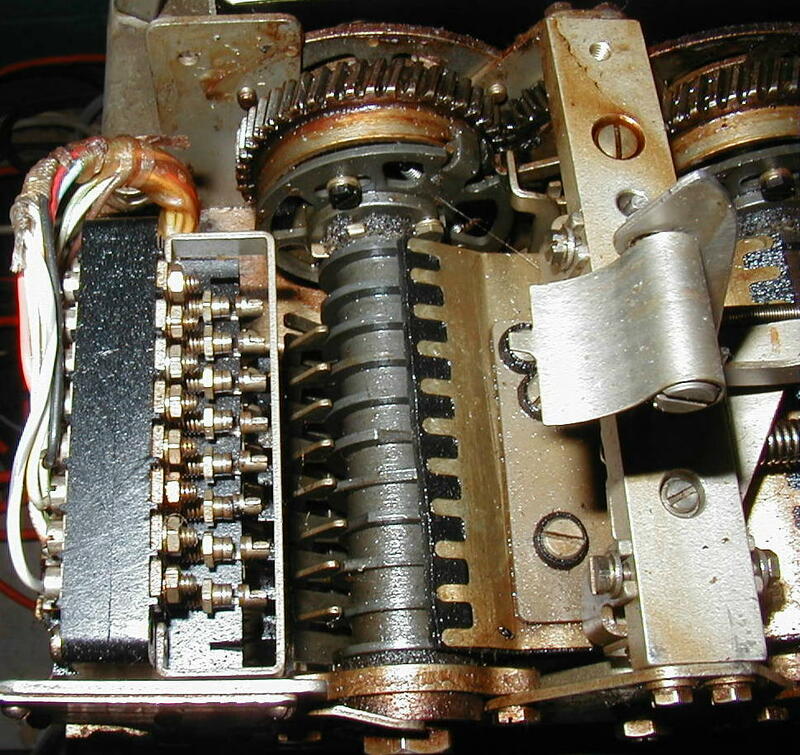 Giant shift registers (available in MOS ICs) or large magnetic core memories could provide storage, but the electronics become a nightmare for the average amateur. 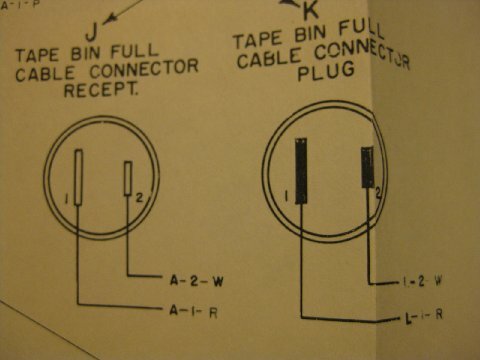 In the RT set, the paper tape is the storage medium. At ten characters per inch, you can store quite a message in a few feet of paper tape. 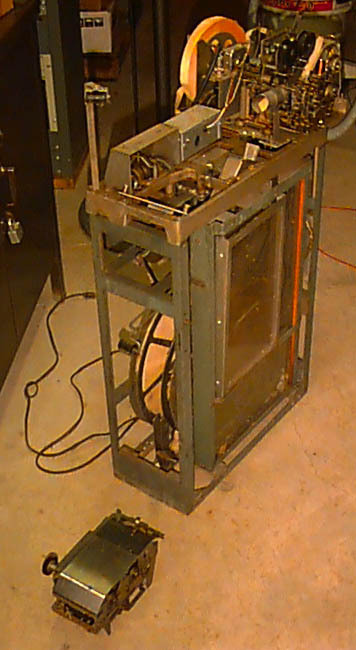 Since most 28 RT sets come equipped with the 28 LPR typing reperf with the single magnet selector mechanism, which is a simple two wire connection into the loop, the bulk of this article will describe the connections for the LAXD “creep-head” T-D. 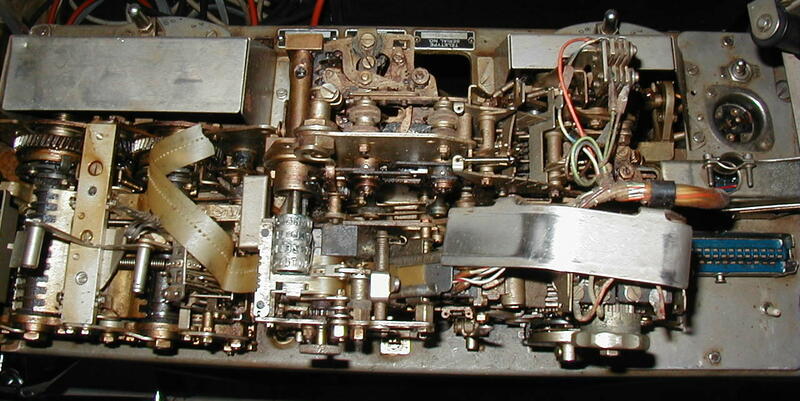 In talking with several amateur RTTY suppliers, it appears that most amateurs prefer the simple single contact LXD T-D to the model 28 multi-contact T-Ds. The model 14 T-D is a multi-contact T-D, the main difference being that all of the connections between the transmitter (or sensing head) and the distributor were made at the factory. Hooking up the LAXD is simply a matter of connecting the transmitter output (Parallel output) to the distributor input (parallel input), taking the serial output from the distributor, and connecting the control circuitry. The circuit diagram shows a “deluxe” arrangement as far as the control circuit goes, and this can be simplified if you wish. 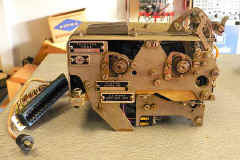 The latching relay circuit shown is required if you want the T-D to shut off if it should ever run out of tape completely. You can mount the start and stop buttons conveniently at the operating position and remote locate the rest of the noise generating machinery! 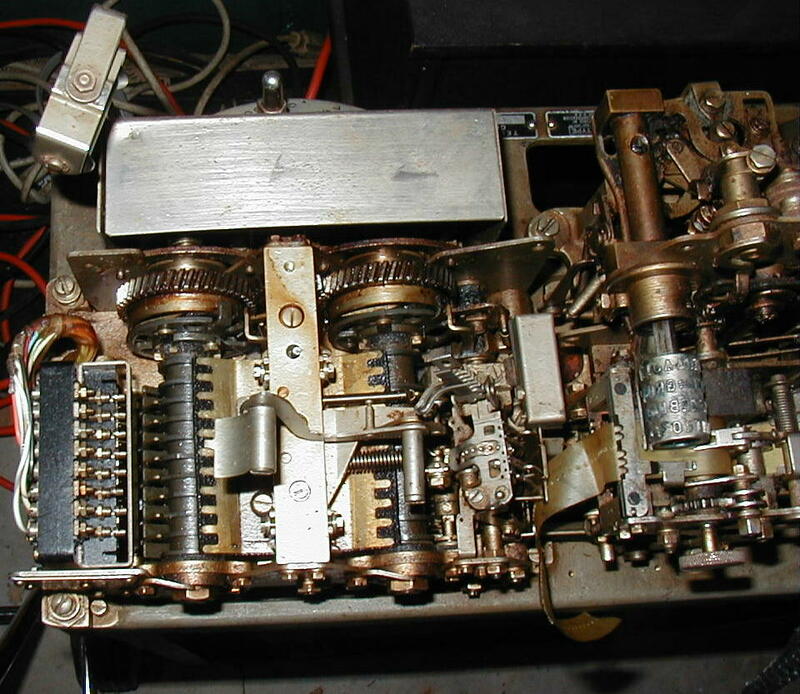 For K-1, I used an Allied T154CC-CC, which has four sets of contacts. 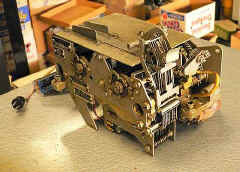 One of the extra sets can operate a light to tell you when the T-D is operating. 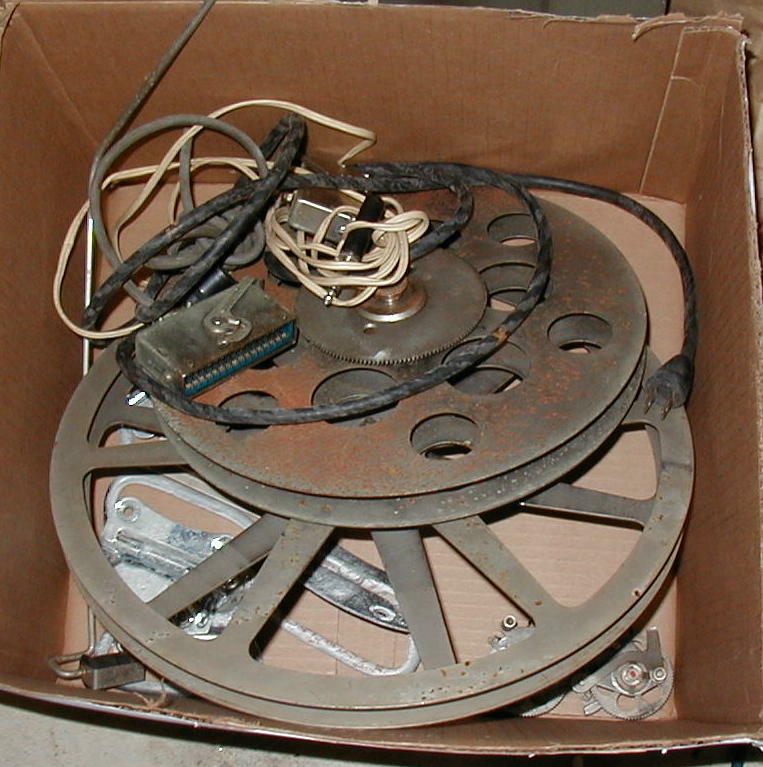 Another light can be operated by the low tape switch in the reperf tape supply reel so you know when you are about to run out of tape. 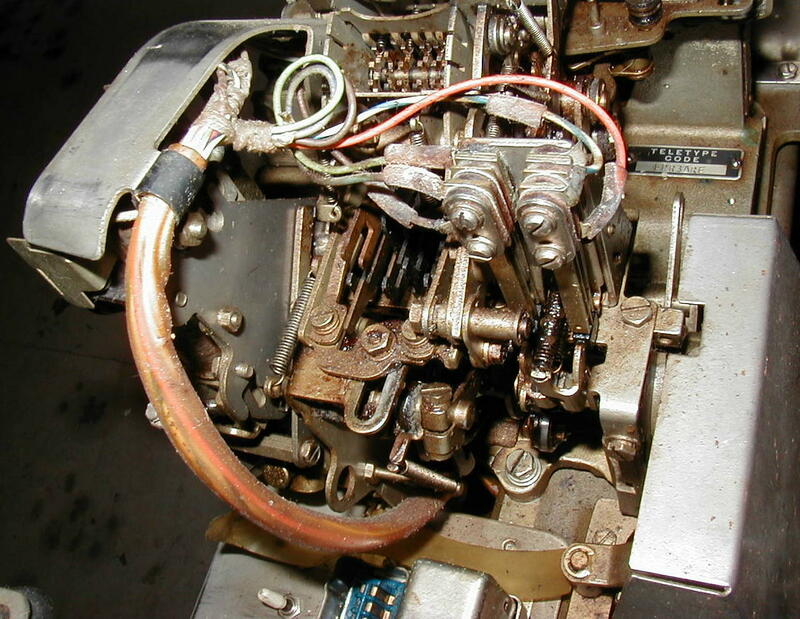 It is important to observe that the transmitter auxiliary contacts are in series with the distributor release coil. These contacts are normally open, and will close for a short time after the transmitter has “sensed” the holes in the tape and stored the combination, allowing the distributor to operate for one cycle distributing the combination stored in the transmitter. 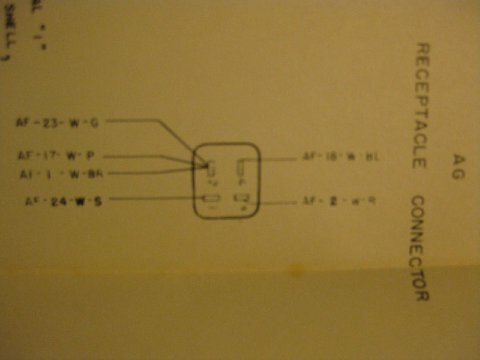 This connection must be made or else the unit will send only garble if it sends anything at all Attention is called to the fact that the last character switch, the out of tape switch, and also the added stop switch are all normally closed. One change, which can be made, is a matter of preference. 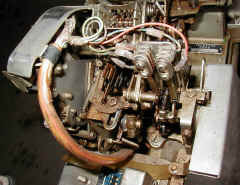 Using the circuit as shown in the heavy lines, the T-D will shut off after it has read the last character punched, and will not read again until the start button is pressed – providing that the reperf has punched more tape to be read. 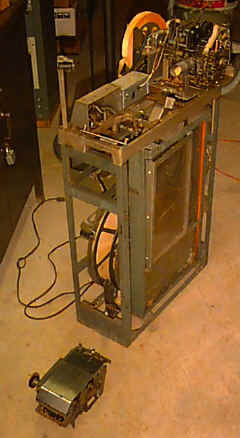 If the heavy lines are broken at the three Xs and the dotted lines added, the T-D will stop reading after it has read the last character punched, but now if more tape is punched, but now if more tape is punched, and the stop button has not been pressed, the T-D will start reading the tape again and will continue until it reads all the tape again or until the stop button is pressed. 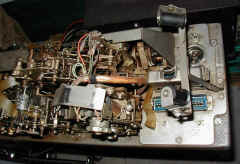 If you don’t care about out of tape shut off, simply delete the relay, don’t use the out of tape contacts, put the last character switch (dotted lines) in series with the transmitter release coil, and finally replace the relay contacts in series with the transmitter release coil with a SPST switch which becomes the T-D operate switch. If you don’t use the latching relay, and the T-D should ever run out of tape, it will send “letters” continuously until shut off manually. The pin numbers given are for the Amphenol 26-4401-32S connector on the LAXD-1, and will probably be good for most units. If you are not sure, a simple ohmmeter check can be made. Please note that the 110-volt DC input is a control voltage source and not the loop. The loop supply can be used if it is hefty enough (allow about 300 ma. 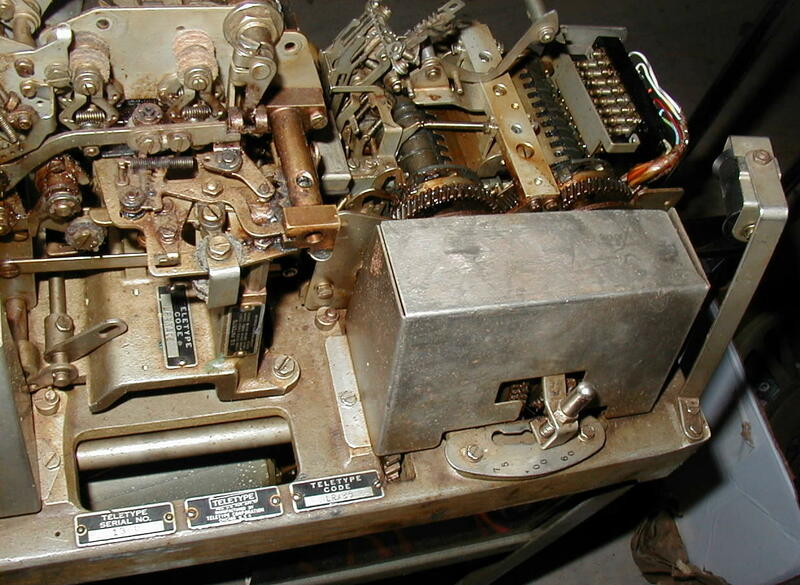 For the control circuitry), but a separate control power supply would be best. 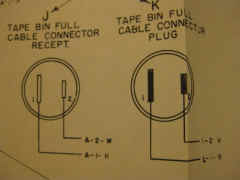 The only connections made to the loop are the two T-D output wires hooked in series with the printer etc. If heavy arcing is experienced at any of the control contacts, they should be shunted by a series RC arc suppressor network. The basic hookup for the LBXD T-D is essentially the same as shown for the LAXD. 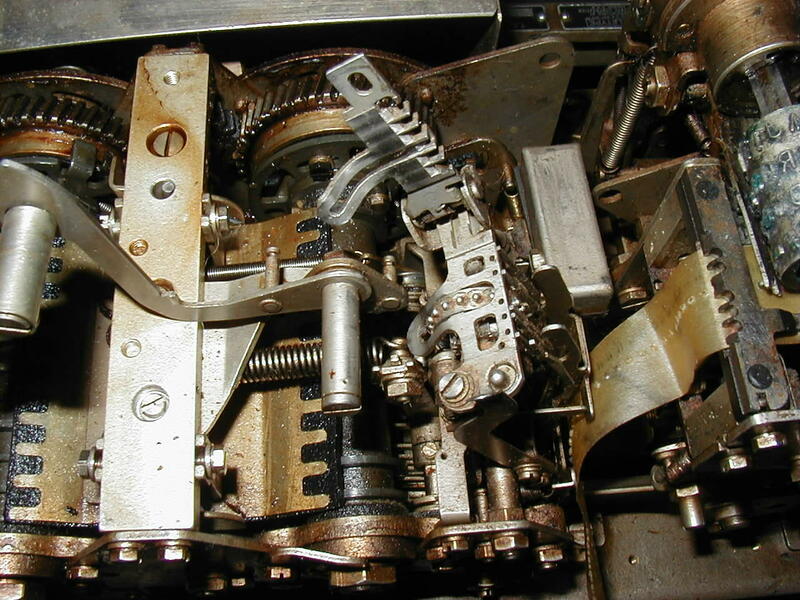 The elaborate out of tape circuit is not required with the LBXD since its out of tape switch is spring operated rather than cam operated as in the LAXD. 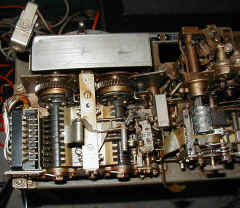 Also for those with a LBXD or another LAXD the transmitter from one T-D can operate the distributor in the other unit or vice-versa. Simply replace the transmitter output-distributor input jumpers with a multi-pole two position switch. 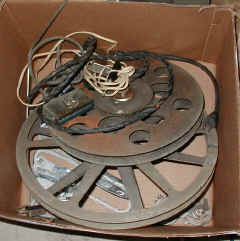 Be sure to bring along the transmitter auxiliary contacts and the release coils.